For optimal visualization of CCR7 expression on different cell types it is necessary to use multi-color staining to discriminate different cell subsets as well as following the protocol (incubation at 37C may be necessary). To address specificity, the staining profile of 4B12 has been compared to a polyclonal antibody generated against a CCR7 peptide (Bjorkdahl et al). This analysis confirms that the polyclonal antibody and 4B12 stain similar populations of cells. Furthermore, 4B12 stains mouse CCR7-GFP fusion protein-transfected RBL cells (see data in cat. 14-1971). Applications Reported: The 4B12 antibody has been reported for use in flow cytometric analysis. 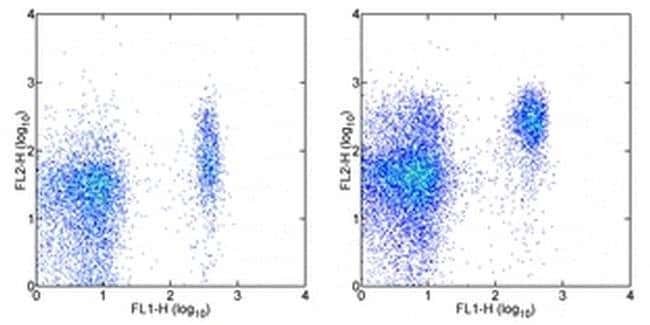 Applications Tested: The 4B12 antibody has been tested by flow cytometric analysis of mouse splenocytes and thymocytes. This can be used at less than or equal to 1 µg per test. A test is defined as the amount (µg) of antibody that will stain a cell sample in a final volume of 100 µL. Cell number should be determined empirically but can range from 10&Hat;5 to 10&Hat;8 cells/test. It is recommended that the antibody be carefully titrated for optimal performance in the assay of interest. Important: Staining with the 4B12 monoclonal antibody requires different conditions than typically used for surface-antigen staining. Please use the protocol below. Moreover, we have found that staining at 37°C, rather than 2-8°C, results in brighter 4B12 staining, as well as better resolution between positive and negative populations.Please see the data above which demonstrates a comparison of staining at 2-8°C and 37°C. Staining with 4B12 at 37°C is not expected to interfere with co-staining other antigens, however this should be evaluated for individual experiments. 1. Prepare cell suspension as normal and block Fc gammaIIIR/Fc gammaIIR with 5 µg/million cells purified anti-mouse CD16/32 (cat. 14-0161) for 15 minutes on ice. If red blood cell lysis is carried out as part of cell preparation, ensure that fixatives are not present in the red blood cell lysis solution as this will eliminate 4B12 staining. 2. Without washing, add 1 µg/million cells 4B12 and incubate in a 37°C waterbath or at 2-8°C (please see notes above) for 0.5 hours. 3. Wash cells 1X with 3 mL of Flow Cytometry Staining Buffer (cat. 00-4222) and decant supernatant. 4. Analyze cells on flow cytometer or proceed with secondary staining on ice as normal. Note: Co-staining mouse CCR7 with the 4B12 antibody and the CCR7 ligand CCL19-Fc (cat. 14-1972) may be difficult due to different binding conditions required for the antibody versus the ligand, and steric hindrance which may prevent co-staining of 4B12 and CCL19-Fc. Cross-blocking experiments have demonstrated that 4B12 binding is able to prevent the detectable binding of CCL19-Fc, however not the opposite. Furthermore, the correlation between 4B12 and CCL19-Fc staining may be difficult to predict due to the presence ofunknown CCL19-Fc receptors in addition to CCR7. Excitation: 488-561 nm; Emission: 578 nm; Laser: Blue Laser, Green Laser, Yellow-Green Laser. Filtration: 0.2 μm post-manufacturing filtered. CCR7 is a member of the G protein coupled receptor family, which is a subfamily of chemokines. CCR7 was identified to be induced by the Epstein Barr virus (EBV), and is thought to be a mediator of EBV effects on B lymphocytes. CCR7 has been reported to be expressed in blood, bone marrow, lymph node, and intestine. CCR7 is particularly expressed in lymphoid tissues and in activated B and T lymphocytes and has been shown to control the migration of memory T cells to inflamed tissues, as well as stimulate dendritic cell maturation. The chemokine (C-C motif) ligand 19 (CCL19/ECL) has been reported to be a specific ligand of this receptor. ESTs have been isolated from blood, embryo, lymph node, and thymus libraries. Receptors for the C - C chemokine family include CCR 1, CCR 2A, CCR 3, CCR 4, CCR 5 and the Duffy blood group antigen. The C-C receptors are important in the function of T cell chemotaxis and migration of phagocytic cells to sites of inflammation.